Starring Sarah Polley, Ving Rhames, Jake Weber, Ty Burrell, Kevin Zegers, Mekhi Phifer. Directed by Zack Snyder. (2004, 100 min). That's a rhetorical question, by the way. Everyone loves Oreos. There's a damn good reason these delectable delights are the best selling cookies in the world...they're the perfect marriage of wafer and creme. Not only that, Oreos are the all-purpose cookie...great with ice cream or turned into pie crusts. And who on Earth hasn’t simply tossed a few into a glass of milk in the middle of the night, turning them into divine ambrosia before spooning this orgasmic mush into our mouths? If Brad Pitt and Angelina Jolie were snack foods, the offspring of their consummation would be a milk-soaked Oreo. Sorry, but you just can’t do that with Fig Newtons. As a kid, whenever Mom returned from grocery shopping with a fresh package of Oreos, my sister and I felt truly loved. It also made me feel sorry for my friends whose parents demonstrated utter hatred for their own kids by bringing home Hydrox instead. Hydrox were widely regarded as a cheap knock-off of Oreos. Parents cruel enough to pack them in their kids’ lunches were usually reported to Child Protective Services for suspected abuse. There were actually occasions when my own Mom brought home Hydrox instead the usual Oreos. Whenever I inquired why, she'd quip, "I'm not your real mother." I guess that was easier than just admitting cash was tight that week. But what parents failed to realize was, in elementary school, the contents of your Scooby-Doo lunchbox said a lot about your socio-economic status. Classmates packing such precious processed products by Hostess, Frito-Lay and Nabisco were the envy of the cafeteria; those stuck with Dolly Madison, Granny Goose and Sunshine cookies were the lowly brown-baggers. On the plus side, however, no one ever stole their lunches. It wasn’t until just recently that I learned Hydrox’s creme-filled sandwich cookies have actually been around since 1908, a full four years before Oreos hit the shelves. In fact, it was Hydrox that initially inspired the National Biscuit Company (a.k.a. Nabisco) to create their own version. All this time, Oreos were the actual knock-offs. But first doesn't always mean best. Sunshine may have come up with the idea, but Nabisco turned it into something perfectly irresistible, which is why Oreos still fly off the shelves and Hydrox exist only in the memories of those with tortured childhoods. 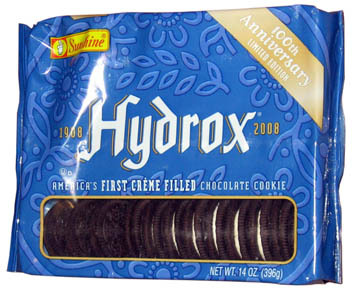 On a side note...isn't Hydrox a terrible name for a cookie in the first place? It sounds like an acne medicine. Similarly, few will argue that the great George A. Romero is the godfather of the modern zombie as we've come to know it. 1968's Night of the Living Dead was a taboo-smasher and the first to depict the undead as mindless, perpetually hungry hordes. In ensuing years it was oft-imitated but never duplicated, at least until Romero himself unleashed Dawn of the Dead ten years later. Not-only did Dawn up the ante in the gore department, the film had a lot to say about American consumer culture at the time. It is widely considered the greatest zombie film of all time, the standard by which nearly every other subsequent film in the genre has been measured. And for the longest time, I concurred. 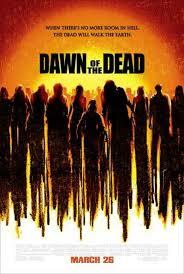 I first saw Dawn of the Dead with a couple of friends when I was 15 and, aside from the fact it made one of them puke (you can read about that HERE), it redefined horror for me. Not only was it funny, suspenseful and loaded with social commentary relevant for its time, Dawn became the movie I dared friends to endure when it was released on home video. For years, Dawn was as untouchable as The Exorcist and Psycho...a film which could never be improved upon. Though not for a lack of trying, since Dawn was liberally ripped-off over the years, mostly by Italian hacks like Lucio Fulci and Bruno Mattei, who assumed the film’s only appeal was the extreme gore. Though the popularity of zombies has fluctuated over the years, few would argue that their impact on 21st Century popular culture has been a phenomenon, with video games, horror movies, TV shows, parades and books all dedicated to presenting the undead as Romero first envisioned them back in 1968. Considering the ongoing Hollywood trend of remaking classic horror films, revisiting Dawn of the Dead was inevitable. The announcement was met with resistance, of course, mostly by those (including yours truly) who considered the original an untouchable classic. When you throw in an unknown director at the time and backing from a major studio (who typically shy-away from hard-core visceral gore), how could a remake of Dawn of the Dead be anything but a shallow shell of a movie, watered down to appeal to the mallrat crowd (especially since the screenwriter, James Gunn, was best-known at the time for writing Scooby-Doo)? 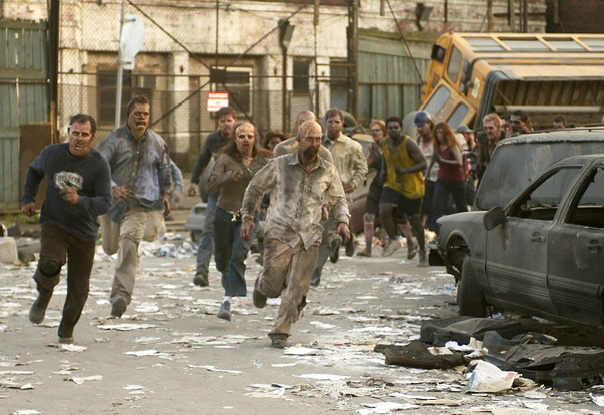 So imagine everyone’s shock when this new Dawn of the Dead turned out to be not-so-much a remake, but a creative and rousing re-imagining of the original material, a legitimate zombie film in its own right. Gunn and director Zack Snyder took the premise (survivors trapped in the seemingly idyllic existence of a shopping mall) and jettisoned everything else that endeared legions of fans to Romero’s film. Other than a few respectful nods to the original (mostly Easter eggs and cameos), the new Dawn had a personality as unique as John Carpenter’s remake of The Thing. Though it pains me to do so, it’s at this point that I must commit an act of heresy by admitting I think the new Dawn of the Dead is better than the original, the cinematic equivalent to Oreos vs. Hydrox. I’m well-aware of Romero’s legacy and his use of the undead to address society’s ills. The man has all of my adoration and respect as one of horror cinema’s most influential founding fathers. But having seen all of his zombie films multiple times, the ugly fact remains that Romero’s noble ideals tend to overshadow his actual abilities as a filmmaker. He has a shitload of audacity, a welcome trait that makes his movies true treasures (especially 1985’s Day of the Dead, his best-crafted film). But the fact remains that, unlike contemporaries such as John Carpenter or David Cronenberg, Romero has no distinctive directorial style of his own other than his willingness to push the envelope. Looking at both films as objectively as possible, the original Dawn of the Dead does some amazing things with a limited budget, but is also hampered by it: Tom Savini’s make-up effects are suitably extreme, ranging from gorge-stirringly gory to ridiculously daffy (blue-skinned zombies and garishly bright blood). The same can be said for the performances, which range from serviceable to downright amateurish. We may like these characters, but the actors are only a notch above what you’d find in a community theater production. The editing is often clumsy, which also applies to its semi-legendary soundtrack, an uneasy combination of Goblin’s influential & hypnotic rock score (at co-producer Dario Argento’s insistence) and Romero’s preferred public domain library tracks. While old school purists will likely consider these elements part of the original film’s overall charm (and they wouldn‘t necessarily be wrong), these same elements also render it a low budget product of its time. And it has aged badly. By comparison, Romero’s once-maligned sequel, Day of the Dead, belies its grassroots production values every step of the way, resulting in a film which actually holds up better, despite being 30 years old. The 2004 remake starts off brilliantly, its first 15 minutes setting-up the story with a stunning opening attack and montage (creatively incorporating Johnny Cash’s “The Man Comes Around”) which not-only sets the tone, but defiantly lets the audience know this ain’t your daddy’s Dawn of the Dead. Gone are the allegories of 70’s consumerism, and while such other satirical opportunities are largely absent, its simple theme of survival at all costs carries additional apocalyptic weight. Its characters are far more eclectic and believable, ranging from common housewives and salesmen to disillusioned police officers and douchebag yuppies. Likely due to the increased budget, this version of Dawn features a cast who display more range than those in the original. Also unlike the original, which has too many dull stretches to justify its length, the remake trims the fat considerably...it's leaner, meaner and (dare I say it?) ultimately scarier. Then there’s the violence, which, if we’re to be honest, is a big reason for any zombie movie’s appeal (how else can you explain the nostalgic popularity of Lucio Fulci’s sleazy shitfests?). Even though this version of Dawn of the Dead was released by Universal, the film is bloody as hell, going as far to depict an infected woman giving birth to a zombie baby, followed by the violent death of both. This is arguably the most brutally-Romeroesque gag that George himself never thought of. And even if you're not a fan of this version, you have to admit the scene involving a rifleman picking-off celebrity lookalikes is inspired. These revelations were hard for me to accept. I’ve always been one who believed the greatest movies should never be remade, since there was no way to improve on perfection. For the longest time, I believed the original Dawn of the Dead to be one of those films. But if I’m to be honest with myself, after multiple viewings of both, I’m increasingly inclined to concede Romero’s Dawn is far from perfect and the remake is more entertaining. And let’s face it, even though he’s gone on to bigger things, this arguably remains director Zack Snyder’s smartest, most cohesive film. So from my perspective, George A. Romero might be considered the founder of Sunshine, creator of Hydrox cookies, only to be ripped-off by the likes of Zack Snyder and James Gunn, turning an already great product into something even better. As much as I hate to admit, Romero’s film is now the cinematic Hydrox.